Found out about [this behind-the-scenes tour] only days after I last went to Walt Disney World, and as Florida is about 1000 miles away from my home, going there isn't exactly a knee-jerk decision. Except for this time. Finalized my plans & payments for air fare, lodging, and of course the tour within 48 hours of my becoming aware of the event. So less than 3 weeks after I left (post-Happy Haunts Ball), I found myself returning to Florida for barely 24 hours so that I could cram in a walking tour of The Haunted Mansion. I'm very nocturnal by nature. And I'm generally very wound up before a Disney run. What that all amounts to is that I didn't sleep the night before I left for the trip. And what that means is that I was awake from 8:00 A.M. Tuesday, November 19, 2002 until around Midnight Thursday, November 20... But IT WAS WORTH IT. Arrived at the Orlando airport before 9:00 A.M. Wednesday (keep in mind: I'd already been up more than 24 hours at that point). Got a rental car. A nail polish red Pontiac Batmobile. Headed for Walt Disney World. It wasn't even 9:00 A.M. when I arrived, but my room was ready (check-in is normally at 4:00 P.M.). This may have been the most difficult moments of the trip: I saw my bed. But NO - I had a day left on a Park Hopper from my previous stay, and I wanted to cram some stuff in before I was to meet friends that afternoon to go hook up with our tour group. So I forced myself to leave, and went to Animal Kingdom. 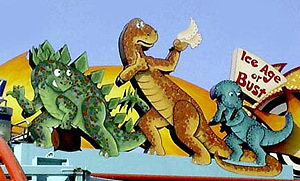 Needed to see those Hitchhiking Dinosaurs on Primeval Whirl that DoomBuggies members here have been talking about for myself. After that, I bee-lined to the Mansion for three ridethroughs (I usually do the attraction in sets of three - it "feels" right to me that way). Took a buncha shots of the facade, & headed for Pirates, where I did two spins. Then I bolted. Had an Adventureland eggroll on the way out and returned to the resort, where I met up with friends. The organization for getting to the walkthrough was unfortumately quite convoluted and poorly executed. We had to drive off Disney property to the Orange County Convention Center, grab a bus, and go BACK to the Magic Kingdom. LOTS more twisted stuff than just that happened, but it's for another thread and another time. Trust me: it was TRYING. Now I'll skip ahead to the cool stuff. Our group was perhaps 60 - 70 people, and our very loaded bus entered the Magic Kingdom by driving past the Grand Floridian and over a bridge behind a huge hangar full of every float ever in a WDW parade (I'd seen this once before on a Keys to the Kingdom tour, but that time we'd came up on it from the front). We were in "You photograph it and you die" territory. We were split into three groups of 20 or so (one tour guide each), and strolled into the Magic Kingdom between the show buildings for Pirates and Splash Mountain. It was WEIRD, folks. Nobody was at Disney World except for a few maintenance guys and us. The sun had gone down some time before, and all the lights were on. The soundtrack music was playing full blast. And NO ONE WAS THERE. Really cool. We walked into an all-but-abandoned Liberty Square where our guide gave us some history/trivia while we waited for some others to catch up. When all the groups were together, we did a guests-perspective ridethrough of The Haunted Mansion. Carlotta and Broom were our hosts, and were typically over the top. It was a great fun, but fairly typical runthrough. The funniest part about it was that Little Leota appeared to have some pretty severe hiccups at the conclusion, i.e. "Hurry baa-aack, hurry baa-aack, hur hur huurry baa-aack, h-h-h hur-hurry baa-aack..."
We entered the Load area, where the worklights had been turned on, and the Doom Buggies were still and silent. I was mouth-breathing as the group walked through the portrait hall. We entered the Library, and everyone stood at the level of (or behind) the Doom Buggy track. It was unbelievable that is was... okay to cross the invisible threshold that was the show area. Then someone did it. Stepped onto the set. Several of us timidly followed suit, filed in, and took several minutes inspecting the props up close. Somewhere beside me, a friend brought the moment into perspective for me. He quietly muttered, "Oh, my God - I'm walking around in the Library!" It was at that moment that I formed the thought, "Holy CRAP - so am I..."
Moved on to the Music Room, where the piano keys continued moving with the soundtrack turned off, which exaggerated their loud "PSHHHP" sound. Stood right over the pieces of sheet music on the floor - noticed that there really wasn't notations marked on those pieces (like the ones still on the music stand). Walked up the spider staircase - which for the first time, I noticed is NOT a staircase at all, but rather a ramp (I really thought that there was an access stair for cast members right there). Turned the corner, and we were actually allowed to step INTO the threshold of the fully-lit Endless Hall! Then: what have I always wanted to see? Ballroom ballroom ballroom! ...into the filthy alley between the Mansion and Small World (?!?). 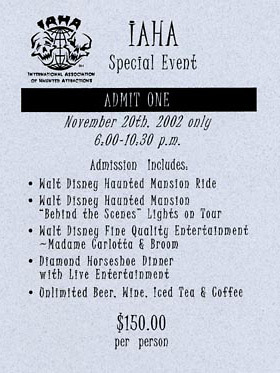 Far as anyone has been able to discern in the aftermath, the Disney staff, afraid that our food was getting cold, chose to cut the tour short without a walkthrough of the Attic or the Graveyard, so that we could go to Diamond Horseshoe and eat. VERY disappointing. But what we DID get to do was fantastic! To call it "once in a lifetime" is probably very, very true (for me)... And hey - I got to WALK the Ballroom! I high-fived a friend as we walked to dinner. Anticlimactic as it may sound, the food was FANTASTIC (I recommend the prime rib, thank you very much). After eating, we did the obligatory DoomBugs portrait. After dinner (which came complete with a live piano player tinkling an 1800's saloon version of "Margaritaville" and a grifter/card shark magician guy who was really very good), we again walked through the creepily empty park and got back on the bus... went BACK off property to the car, and drove BACK to Disney World... AGAIN... to turn in. Let's see, I guess I'd been awake for perhaps... 40 hours or so when I got to my room. So falling asleep resembled a blackout. But was it worth the strain? YES. Even though the tour was cut short? YES (but I wish it hadn't been). Would I do it again exactly the same way? YES!